According to the American Psychological Association of America one out of four people over 65 will live longer than 90 years of age. Now imagine the various needs of each of these adults by that time. Some experience unfortunate changes in health including chronic conditions and diseases. Others may no longer have the ability to complete daily activities like bathing or eating. While others may notice a decline in cognition and mental health. And just as people are unique, their needs also require a very different solution. For those older adults who encounter changes in mobility following an accident, injury or serious health condition, physical therapy can help improve strength and balance, keep the body active and build confidence in the process. It’s also beneficial in helping seniors remain more independent and productive. Changes in problem solving, language and memory function are a normal part of aging. And while many seniors experience signs of cognitive decline as they get older, others do not. Scientists have dedicated countless hours to researching ways to help improve and even retain memory recall. One of the most promising methods of treatment for people suffering from Alzheimer’s and dementia is music therapy. Music has been known to help alleviate stress, prevent depression, promote movement and stimulate brain waves in patients who have experienced cognitive decline. Through music therapy, patients experience changes in breathing and heart rate – triggering a relaxation response. Doctors say this is helpful in the elimination of chronic stress. It also helps to induce a more positive state of mind. The sound of music and its cleansing messages can even create higher levels of optimism and boost creativity. Researchers also say that music can stimulate brainwaves causing them to resonate with a strong beat. Faster beats produce sharper concentration while slower tempos foster a calmer, more reflective state. Music is not the only therapy that has been shown to help facilitate communication in dementia patients while increasing the quality of life. Patients who engage in art therapy use it as a way to communicate with those close to them – where there is a loss of words or mental recall, art therapy provides them with a way to unlock memories and share them through their work. 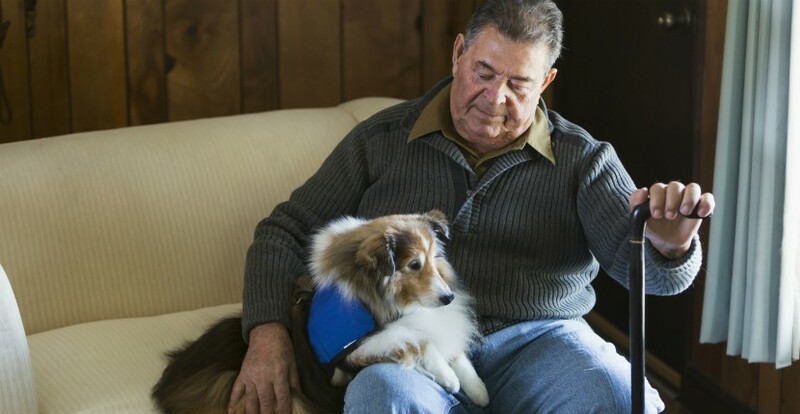 Pet therapy is another popular method of assistance for seniors suffering from Alzheimer’s or dementia. Studies show that pet therapy not only increases the general health and well-being of those with the disease, researchers say it also shows signs of improving social, emotional and cognitive aptitude. If you’re looking into different therapy options, Freedom Home Care can help. Our senior care specialists can assist in helping you find your loved one appropriate therapy.